I hear many a times people saying that they hate eggplant or as we say ‘baigan’ in Hindi. However, I always liked eating eggplant. My mom had advised me to relish eggplant sabzi since childhood. Plus, the nutritional benefits of Eggplant are certainly not something that any of us can deny. Eggplant is full of fibre; it really bolsters the function of the digestive tract and even prevents colon cancer. Plus, ladies, eggplant is low in calories, so you can eat it with peace. Also, eggplant is rich with iron, calcium and minerals which are wholly essential to maintain a healthy body. The snow peas thatI have used in this dish were a surprise find. It’s quite difficult to get Snow Peas in India and they are only available in some gourmet food store with a heavy price tag. But on my last visit to Namdharis, I was delighted to see Snow Peas on their shelves at 25 Rs for 100 gm and without a second thought, I picked up a few packets. We have been munching on them as salads, stir fries and curries like this since then. I love Thai cuisine. 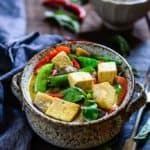 For the fact that there are many flavors which Thai cuisine allows me use in my dishes: it is indeed a jumble of flavors but every recipe of Thai cuisine has a subtle rhythm of taste. While making Thai Green Curry with Eggplant, Snow Peas and Tofu, I took care of the same. I used different ingredients such as garlic, green curry paste, bell peppers, lime leaves, basil, brown sugar, red chilli et al along with eggplant so that the dish has a riot of flavors. Additionally, Tofu provided tenderness and more nutrition to the dish. Needless to say, my little one who never ever touched eggplant ended up finishing his entire bowl of this luscious Thai Green Curry with Eggplant, Snow Peas and Tofu. Even I relished it with piping hot plate full of rice, I completely loved it. I am sure you would love this recipe as well, so quickly take note of the ingredients and try it out today! 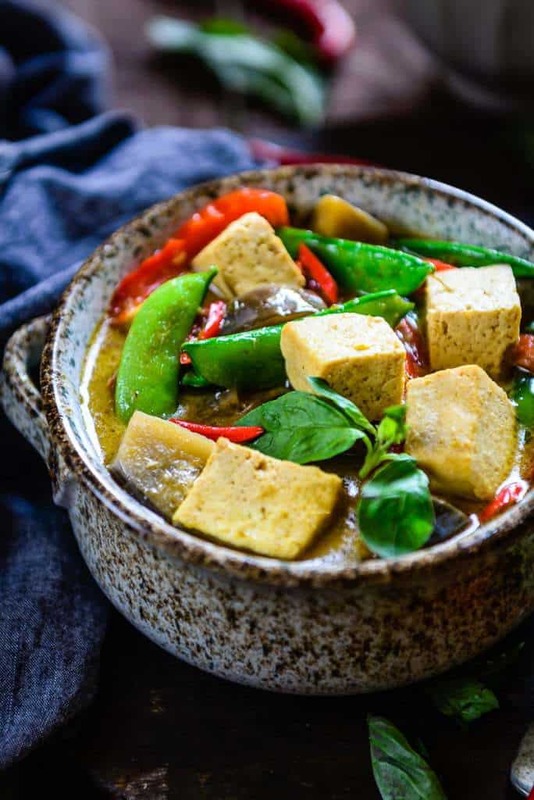 Here is how to make Thai Green Curry with Eggplant, Snow Peas and Tofu. Recipe to make Homemade Thai Green Curry Paste is Here. Add green curry paste and fry for a minute. Add eggplant, snow peas, tofu and bell pepper and fry for another minute. Add kaffir lime leaves, vegetable stock, fish sauce, brown sugar, lemon juice and salt and cover the pan and cook it on a low heat for 10-12 minutes. 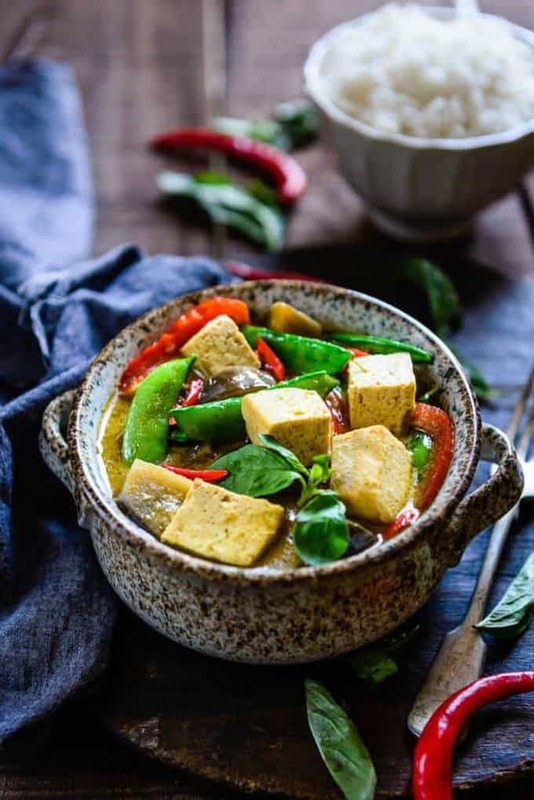 Add coconut milk and <g class="gr_ gr_84 gr-alert gr_spell undefined ContextualSpelling ins-del multiReplace" id="84" data-gr-id="84">thai</g> basil and cook for another 2-3 minutes. Garnish with fresh coriander and red chilli. Thnx for noticing. Will update it.